This is our Trans-Siberian video summary of the first month of our travels. 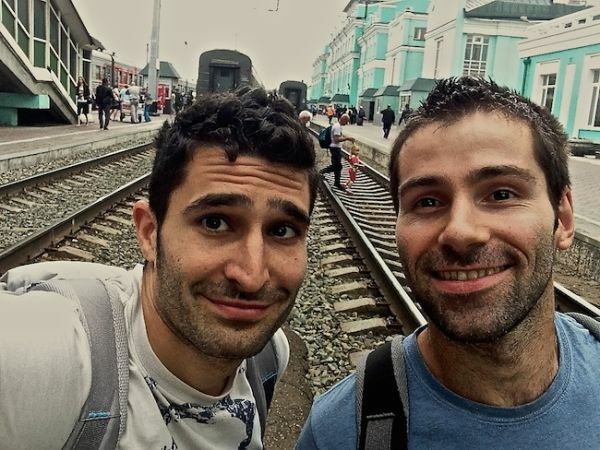 We started in Riga (Latvia), then headed to St Petersburg and Moscow to start our Trans Siberian adventure to Olkhon Island on Lake Baikal via Yekaterinburg, and we also explored whether Russia is safe for gay travellers. Hi Nomadic Boys. I just found your post on Twitter! ‘Love the video. ‘Would so love to take the Siberian fro Berlin to Shanghai or from Moscow to Shanghai myself but I don’t have the time at the moment! I’m busy! Busy! Cheers for the advice Guys! I was wondering if you could also mention any standout hostels you stayed in as part of your trans-siberian adventrure! 🙂 ! I’m setting off in a couple months to travel the Trans-Siberian railway from St. Petersburg to Mongolia !! I was wondering if you could list some of the best places you visited, and whether you think doing the journey solo is a good idea? Hi Steg thanks for the message. You will be fine by yourself. Tip – there’s a samovar so take bowls, cups, supermarket food and stuff like tea/coffee/sugar. St Petersburg was obviously lovely. Moscow too. We stopped at Yekaterinburg to break it up and it’s got a line going around the city to follow all the tourist attractions (look out for the QWERTY keyboard and Beatles monument). And finally Irkutsk is nice for a trip to Lake Baikal. The journey from Irkutsk to Ulan Ude is the most scenic so do this during the day. We then took the bus from UU to Ulan Bator because it was cheaper and quicker. Mongolia itself was one of the highlights of our entire trip and stayed there a month. Great video 🙂 Looks like a really interesting trip and the views from the train were beautiful. What is that weird instrument the bearded man was playing?! Brilliant video nomadic boys! Bring them on… We loved watching – boys especially!!!! and so good to see your laughing faces shining in front of me again. just like the old days!